My name is Yusef, Joseph; and “may God add posterity” is what it means in Hebrew. (A bit ironic as you soon may understand.) My story begins I suppose the day Joachim of Nazareth promised his daughter to me, his daughter Mariam, Maria, Mary. Her name means “the corpulent one” though my young Mary was corpulent only when she was pregnant. But I digress. Mary’s hand was promised to me when she was 12 years old, and when I was already a grown man. The troubles started only a few months after our engagement. Mary was found to be pregnant. She said she was pregnant by the Holy Spirit – whatever that was supposed to mean. And so I resolved to break off our engagement, quietly, without making any public accusation against her. It would be bad enough for her that she was pregnant out of wedlock and would bear a child – but for me to make public accusation against her – that she had become pregnant and not by me – that would leave her to be stoned to death for adultery. So, yes, I resolved not to marry her but to keep quiet about my not being the father of her baby. But then came the dream – a dream like I’ve never had before, and in my dream I was visited by an angel. Hard to believe, I know, but nothing I have to say is easily believed. And though it was a dream, I think, it was real in a way nothing had ever been real before. 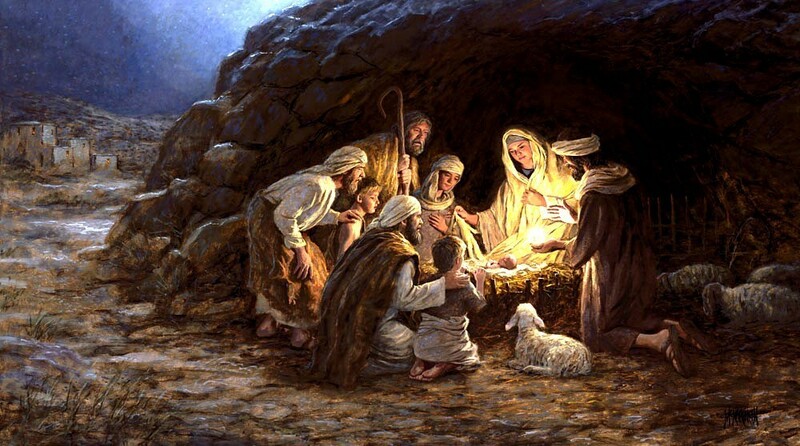 And in this dream an angel from God said, “Joseph, son of David, do not be afraid to take Mary as your wife, for the child conceived in her is from the Holy Spirit. She will bear a son, and you are to name him Jehoshua, Jesus, meaning ‘God is salvation, God saves, God will save.’” And more – the angel said this child Mary was about to bear would be Emanuel, meaning ‘God with us.’ And against all my own reason or strength, I believed – it felt as if something was being born inside of me just as something was being born inside of Mary. And then the time came for the Roman Census and everybody had to go to the town of their ancestral families and since I was an ancestor of King David – a dirt poor ancestor though, believe me – since I was an ancestor of King David I had to go to Bethlehem and because Mary was so very pregnant and I didn’t want her to be alone when she delivered, I took her with me. We packed our few belongings and set out for the long and sometimes treacherous journey from Nazareth in Galilee to Bethlehem in Judea. Mary did as was the custom and took grave windings with her in the very likely event of her baby’s death – you know that in our time only half of babies born survive childbirth. When we arrived in Bethlehem we went to the inn, an inn I could barely afford, but it was full due to all the people coming to Bethlehem for the census, but I pleaded with the innkeeper. “My wife is about to deliver,” I told him. “Can’t you find someplace for us.” The innkeeper proved himself a kindly man and let us take shelter with his animals, in a cave out behind the inn, a cave that likely did double duty – shelter for the innkeeper’s animals and as a grave for the family members. And we settled into the cave none-too-soon – Mary was going into labor and she without a midwife – but I had seen animals bearing their young and so I thought I could be as good as any midwife – and there would be no questions asked about Mary’s condition as a virgin. And yes, I delivered Mary’s child. And we wrapped the baby in the grave windings Mary had brought, and we laid him in the animals’ feed-trough. We were dead-tired and wanted nothing but sleep – but we weren’t to have any, not that night. First there was what seemed like a buzzing in my ears. But then Mary got a look on her face – “You’re hearing it too,” I said to her. “Yes. What is this sound?” she asked. We listened and then looked outside – and the sky was glowing with curtains of bright lights of every color imaginable and the sound seemed to come from the lights – and then the sound seemed to sing, was indeed singing, “Glory to God in the highest, and on earth, peace and goodwill.” And when we went back into the cave, the light seemed to follow us back in – and there was no more need for me to hold up my lantern. And the light seemed to have its source – and I know you won’t believe it – the light seemed to have its source in Mary’s baby Jesus. We shall be strangers and aliens in a strange and alien land – but I dare to hope the Extraordinary will continue to be with us – I dare to hope that all who come into the presence of this little refugee family of ours will be blessed beyond measure, will know that whatever little they do for us – for Mary, for this baby Jesus, and for me – whatever little they do for us they will have done unto the Most High God. Well, this new reality continued past that first night. When we took Jesus to the Temple on the eighth day – well that was strange as well. A man named Simeon sang a song about God’s promise to him that he would not die until he saw Messiah – and now, in our tiny baby – the promise was fulfilled. But one thing especially bothers me about that day: this extraordinary man Simeon said to Mary, “And a sword will pierce your own soul also.” What did the man mean? What was to happen to my Mary – and to my baby, this was my baby – now – and I felt, I feel fiercely protective of this special child – did the old man’s “also” mean something would happen both to Mary and to our baby? But back to the dream I had last night after these magi, these magicians from a foreign land had left. In my dream another angel appeared – this time telling me to take Mary and the baby and flee to Egypt. It seems we and others are about to be hunted down by that horrible King Herod – hunted down and killed. And so we are packing up our few belongings. – And we are about to be on our way, fleeing the evil soon to descend upon our homeland. We are going to become refugees. We never thought something like this would happen to us. But now it is. We shall be strangers and aliens in a strange and alien land – but I dare to hope the Extraordinary will continue to be with us – I dare to hope that all who come into the presence of this little refugee family of ours will be blessed beyond measure, will know that whatever little they do for us – for Mary, for this baby Jesus, and for me – whatever little they do for us they will have done unto the Most High God. And now we must be on our way. Pray for us and for all refugees who are fleeing the evils of their homelands in search of safety and peace. May the Light of my child Jesus be with you all. Amen.